Luxembourg. One of the world's smallest countries, a green and peaceful place bordered by Belgium, France, and Germany. The birthplace of two brothers, Andy and Fränk Schleck, two of the world's best professional cyclists. 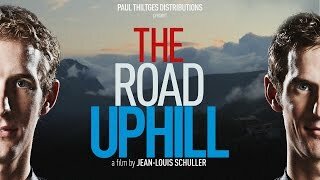 Following Team Leopard Trek and the Schleck Brothers, this film focuses upon the team's participation in the prestigious 2011 Tour de France. It is an intimate cinematic portrait of two brothers and a team under pressure to live up to the expectations of their country. "The Road Uphill" documents the relationships, motivations and belief systems integral to Leopard Trek – core aspects of the team which are not usually exposed by television reportage. This documentary investigates the day-to-day life of a professional cycling team and the physical, mental and emotional thresholds that they need to surmount to win the greatest race on earth.